Rescue Beauty Lounge's spring collection this year is a set of three 'surfer-girl' themed polishes. And the best part? They're not your average bland spring colors! Yay! 360. This is a very soft, hazy greyed-out blue. It seems brighter in my indoor picture than it seems in real life. This is what I would consider to be a slate blue. It looks like a creme but it actually has some extremely subtle fine silver shimmer. You can see the shimmer in the bottle and you can see it a teeny bit when the sun hits the polish, but otherwise it looks like a slate blue creme. Hidden shimmer! Bangin'. Very bright bold and pigmented! I wasn't crazy about it in the bottle, but on my nails I love it! It's an extremely orangey red- or is that a slightly red orange? Maybe it's neither. Maybe it's coral. This looks like coral to me. And it is VERY BRIGHT. Pow! Awesome. When I put on Diddy Mow, the first thing that came to my mind was, "Grey and green? 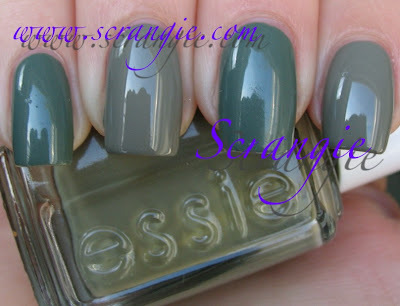 Is this like Essie Chinchilly?" Not even close. Same general idea, though. Grey with green or green with grey. I can't comment on the formula of these since these are only color samples and aren't in the Rescue Beauty Lounge formula... However... if the samples are any indication of the actual formula, it'll be up to the usual buttery Rescue standard. All of these were opaque in one coat and perfectly smooth. So.... I'm not worried! While I like the colors in this collection, the thing I love the most is that Ji has once again marched to the beat of her own drum and created a set of colors that are different! They're not your typical spring colors and that makes me really happy. Ji Baek is the master of making unique-colored cremes and these didn't disappoint me. I am especially happy that there is no pink in this spring collection! It seems like she doesn't give in to the pressure to do what everyone else is doing and is free to create colors based on her own eye and inspiration. That impresses me. The release date given for this is March/April 2010 but I do not have a specific date. I do know that when you sign up for the mailing list, you'll automatically be notified when the new collections are released (and sometimes get a chance to pre-order). These are stunning, and once again, Ji proves that she is a nail fanatic's dream come true. I love these and they all look fabulous on you. I love the gray-green semi-skittle look! Thanks for sharing! Your picture of 360, makes me WANT IT!!!!!!! another dusty blue, but it seems very vibrant! Gad, I need these. I always seem to need an RBL collection; why is that? Why do these super expensive polishes always seem so cool?! Gah. 360 is freaking awesome! Thank God! NO PINKS! I love pink, but this spring is oversaturated with them. Ji is a freakin' color genius. I don't like spending $18 on a single bottle, but I've got no problem shelling it out for 360 and Diddy Mow! They are AMAZING! Diddy Mow looks so pretty....still trying to figure out the name though! 360 is hot! I still have not bought myself any RBL. Oh no! 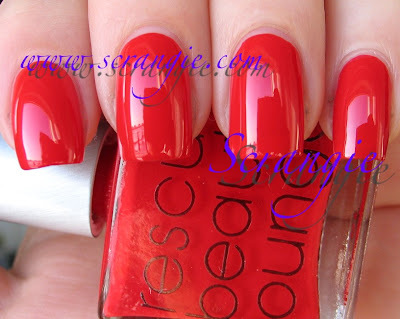 Why must Rescue Beauty Lounge keep making things that don't have dupes that I need. I LOVE Diddy Mow and 360!!! Just awesome!!! Stunning. And green, green. I'm far away from home, but via Skype mye husband just revealed that RBL Scrangie and Orbis Non Sufficit has landed, and I can't wait to get back to were them. No it seems like I have to place a new order ... ugh. Lord only knows when I'll get around to placing another RBL order but I like these =) Although I am wondering how does Diddy Mow stack up against Orbis Non Suffict? Because that's the color that comes to my mind when I think grey & green. Maybe it's a "replacement" color for their core line since ONS is limited edition? I was wondering the same thing as Colette- the Orbis Non Suffict question...is Diddy Mow a lighter version of ONS? And thank you for the Chinchilly comparison- that helps! This is the most creative spring collex I have ever seen. 360 is the most perfect dark aquamarine, i have not seen a np like it! 360 is so gorgeous it makes me want to cry. I'm still on the fence about an $18 polish (though I did buy during the sale), but I can see myself changing my mind for 360. I loves me some dusty blues. Wish I hadn't seen these ;-), really like 'm! Mmmm 360 and Diddy Mow are superb! Just had to say, don't you wonder how many times today Diddy Mow has been googled by one of us nail freaks?! Oooh I love hidden shimmers! And Ji Baek always seems to think outside the box and does what she likes, not what everyone thinks is seasonally appropriate. If Diddy Mow is anything like how it pictures, it is WAY lighter than ONS. I mean super duper way lighter. I have Chincilly and ONS and they're nowhere near the same depth range, and it looks like Diddy Mow is much closer to Chinchilly than to ONS. My wallet will be losing weight soon. I love all of them. A blue I can wear, another unique green and a bright coral. Genius. If RBL ever does a half-off sale again, I'll get 360 and Diddy Mow. They look nice, but I'm not crazy enough about them to justify spending that much. Oddly, Chinchilly didn't really catch my eye when it came out but I want it after seeing it now, LOL. BEAUTIFUL!! I'm definitely getting 360 and Diddy Mow...Ji does it again!! Thank you! Like others, I am wondering how Diddy Mow compares to ONS. And I'm also wondering how 360 compares to RBL Teal. do you know of any online shop where i can order this brand? am currently in Singapore. I'm going to need to save up for at least one of these. I love 360 and Diddy Mow.the red looks too cool for my skin tone, but I sure do like looking at it! Do you know how these compares with the new hong kong OPIs(hot and spicy. Jade is the new black and Suzie says feng shui)? I am sooooo excited for these! RBL always makes me spend my money for the whole collection!! i love that top blueish green color. How do you get your nails so insanely perfect!? 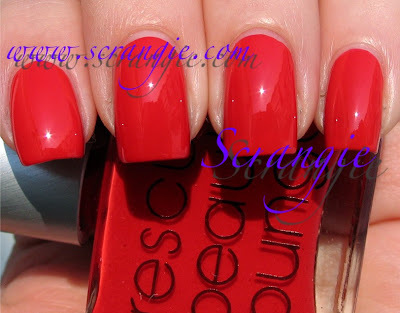 On a different note: RBL re-released the blogger colors and Scrangie sold out AGAIN! What a great snaps. I love all the ones that is here. I am going to buy the first one.